"No matter what Blender projects you have planned for this year, at some point you will need a variety of "Odds n' Ends" to flesh it out. " hen starting a project, we generally have an idea of where it is going to go. A super cool character doing some super cool thing in a super cool setting (or insert other super cool idea here). That's the plan. Unfortunately, plans get messed up for a variety of reasons. Time and skill levels are the two most common problems that mess up our beautiful plan. Or maybe once started, we decide that we really only want to focus our energy on the main character or object. All the added/extra super cool parts would take too long to model and texture. Blender and in this case can save quite a bit of modeling time. You will still have to texture, but that can be as simple or complex as you want it to be. Blender comes preloaded with a variety of useful Add-ons. For our purposes, the Add-ons listed under Add Curve, Add Mesh and Object in the User Preferences>Add-ons dialog are the ones we are looking for. So what can we find in there? IvyGen: will add generated ivy to a mesh Object starting at the 3D cursor. This is a great way to quickly add some plant life to a scene. Sapling: uses Curves to form a wide variety of trees. ANT Landscape: adds a terrain primitive that can be adjusted to create an endless array of landscapes for your scene or character. Bolt Factory: quickly add bolts and nuts. This Add-on also provides a number of options to change the look of the bolts and nuts. Pipe Joints: adds various types of pipe joints. Regular Solids: this Add-on creates adjustable meshes based on the 31 regular shapes as defined by mathematicians of old. Add Chain: adds a chain object with a curve for quick creation. Cloud Generator: lets you create volumetric clouds in a variety of shapes. Fracture Tools: breaks apart an Object, great for bombs and explosions. Grease Scatter Objects: allows you to use the grease pencil to draw where you would like groups of Objects to be scattered around the scene. Think leaves and debris. don't use the "smooth" button. Step 1- At the first step, I selected the default cube and went to the texture panel to create a clouds texture (as shown in the picture). I renamed it: 3D Rocks. Then, I deselect the texture because we will use this texture for shaping the rocks and not for the color. The cloud texture's settings are 0.35 for size and 3 for depth. Step 3- Next I added a displacement modifier and I choose the texture named “3D Rocks”. Later, I reduced the strength to 0.2. You can see that the cube is like a rock now. You can change the cloud texture settings and get different results. Also, you can play with the direction settings in the displacement modifier and get a good result. But we will do this later. mode and I played with the direction setting. Summary: direction setting + shapeless Object=good result for a rock. Don't forget that you don't have to change the direction setting from normal. Anyway, let's do some different rocks ! Step 7- As in the picture, I duplicated the rock twice. I changed their displace ment settings and also changed their size by using "S". Finally, I achieved three different rocks. You can follow what I’m doing by the pictures! and y. Don’t be afraid to try some different settings to get some original rocks. opposite the rocks (see the picture). This plane will be our background. When you saw the render result first, you may have thought that you’ll learn how to create a fire simulation. But sorry, this is just a background image :) . Step 18- I added a new material and I selected the shadeless option because I don’t want the plane to get anything from the lights when we add them. Step 19-20 and 21- I went to the texture panel and added a new texture. 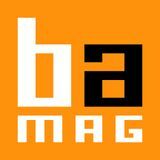 Then, I choose image or movie and I added a new image. You can see the image's link at the end of the tutorial. layer by "M" for compositing. Actually, I can't write the compositing settings in this tutorial, but still, I am showing this. Also, you can see the plane's location exactly in this picture. Step 23 and 24To make sure all the objects stay visible, select the first layer, then hold SHIFT and select the second layer. Step 25 and 26I then renamed the render layers. One of them is Main Layer, and the other is Background Layer. Also for compositing, we have to be careful with the layer settings. I will explain quickly. In the Main Render Layer, every layer is selected except the second layer. Specular is set to on. In the Background Render Layer, the first and second layers are selected. You can select all layers because all the objects are in the first or second layer. The other layers are empty. That is why you don't have to select the other layer for both the Main and Background Render Layer. The sky isn't selected for the Background Render layer either. Anyway, ehm.... just look at the pictures, and try to mimic me. When you make your scene in future, you will learn why you made all the settings. Step 27- Let's go to world settings ! Just set environment lighting to 0.005. Okay, it is not exciting, but it is easy, yeah? You can guess why we did this. For environment lighting :) ! Step 28 and 29Now, we will add some light. This part is really important for a realistic render. I added an area lamp and I moved it like the plane. (you can see it in the picture). I also changed the color of light to make it a little red. see that we are done ! Just press F12 and see your result ! In the render, the shadows are too black but they aren't full black. They are just a little bit bright because of the environment lighting. The rocks are shapeless and have got more polygon. There are some little rocks in the scene. I also used GIMP for brightness of background. I have the 3D view, UV/Image editor, and the properties panels open. The current material is displayed and from here we can start working on the textures. In this article I’ll describe my workflow for texturing my mechanical creations. Using both Blender and GIMP, I quickly create color, bump and specular maps. Blender’s texture paint is used to start the texturing. From here, I use GIMP’s layers and layer masks to quickly add more detail and create the bump and specular maps as well. The mesh I am working with is my Retro Rocket Racer, it has already been UV mapped and has a car paint material assigned to it that I downloaded from: http://matrep.parastudios.de. So let’s dive into it! First up, we will need a blank canvas to start painting on. Left-clicking on the material’s diffuse color will bring up a color picker. Select “Hex” from the three buttons below the color wheel. Now the color values for the material are displayed as one set of letters and numbers (hexadecimal format). Mouse over the value and use [Ctrl+C] to copy it. Now open GIMP and create a new image. For this project I used an image that was 1024x1024 in size. Left-clicking on the foreground color in GIMP opens a ‘Change Foreground Color’ window. Move the mouse to the ‘HTML notation’ field and use [Ctrl+V] to paste the color value. Now use the Bucket Fill Tool to change the color of the image to match the color of Blender’s material. Save the image with a meaningful name and in a format blender can use (I use .png format). This is our blank canvas. In Blender, with a material assigned to the mesh, switch the Properties panel to Textures. If no textures have been created yet, the panel won’t contain much information, that’s about to change. Left-clicking on the ‘New’ button will create a new texture slot and we will be presented with a wealth of data. Right below the texture ID name will be a ‘Type’ selection box and leftclicking on that box will allow you to choose what type of texture we will be working with. Choose ‘Image or Movie’ from the pop-up menu. Scroll through the texture panel to the ‘Mapping’ section to adjust a few settings. ‘Coordinates’ needs to be set to ‘UV’ (since the mesh has been UVunwrapped) and upon doing so a new ‘Layer’ field appears. Set that to ‘UVTex’. Scroll to the ‘Image’ panel, click on the ‘Open’ button and select the new blank canvas image just saved from GIMP to load the image. Select the mesh in the 3D window and enter edit mode. Use the [A-key] to select all the vertices. In the UV Image editor’s header, left-click on the image icon and select the image that was just loaded into Blender. Now our mesh is set up to use the new image as a color map. In the 3D view, we have a few more settings to be changed. In the 3D view’s header. Switch ‘Viewport Shading’ to ‘Textured’. In the transforms panel [N-key] under ‘Display’, set ‘Shading’ to ‘GLSL’. have to be lit by lights. I usually place a few ‘Point’ lamps around the object to light it from all sides.) We now have everything set up for Blender’s texture painting tools. From the UV/Image editor’s header select Image>>Save Image to save our work so far. This will be the basis of the color map, so now it’s time to move over to GIMP to refine it. After creating the layer mask in GIMP, it is now the active image that will be painted on. It can be a little confusing at first, as the active image in GIMP is outlined in white and the layer mask is white as well. Left clicking on the color map will make it active, left clicking on the layer mask (to the right of the color map) will make it the active image to be painted. This layer mask on the color map is hiding the rust texture layer below it. Layer masks in GIMP are grayscale images that control the visibility of the layer below it. The darker the layer mask is, the more transparent the layer mask is and the more visible the layer below it will become. Likewise, the closer to white the layer mask is, the more invisible the layer below it will be. Using the Paintbrush Tool, and using various shades of grey colors, brushes (air brush style brushes work best here) and brush sizes, slowly work to reveal the rust texture following the guidelines on the color map from Blender’s texture paint. During this process, keep changing the brush pattern often, (I have 8~10 grunge type brushes), to avoid a repeating pattern of the brush. The Smudge Tool is very helpful during this process as well by smudging away any repeating pattern created by the brushes. When the layer mask has been painted enough to give a general idea of what areas will be painted, switch over to work on the color map. On the color map, select the base color and paint over the guidelines painted in Blender to hide them. Then go back to the layer mask to finish it up. After a few minutes work on the layer mask, this is my image (UV Layout shown for reference): The UV Layout layer’s visibility can be controlled by the ‘eye’ icon on that layer. the UV Layout layer’s opacity can also be controlled via a slider at the top of the Layers window. Layer Mask. Right click again on this layer and from the menu choose >> New from Visible. Now GIMP has created a new layer that is just our grayscale layer mask. Make this the only visible layer (eye icon) and save the image with a meaningful name and in a format Blender can handle, (Again, there will be a series of prompts to click through). This image is what will be used in Blender for bump and specular maps and I generally use ‘bump’ as part of the filename. Speaking of Blender, it’s time to return to Blender to finish up. The image previously created in Texture Paint can now be replaced with the new color map saved from GIMP. In the Texture panel, with the current texture active, scroll to the ‘Image’ panel and load in the new color map. With the 3D View set to Textured display (as previously described), the new color map is now displayed on the mesh. We aren’t done yet, remember the black and white image saved from GIMP?. Scroll through the texture panel to the Influence panel. Under ‘Diffuse’, uncheck ‘Color’ and your display should return to just the color map since this texture no longer affects the color, (by default, new textures influence the color of the mesh). We need this texture to be our bump map and also affect the specular color. So under ‘Specular’, check the box by the ‘Color’ and under “Geometry’, check the ‘Normal’ checkbox. The mesh may now look a bit distorted (or in my case, a lot distorted), but that can be fixed via the ‘Normal’ slider. The ‘Normal’ slider needs to be adjusted to the point where the bump map barely affects the surface of the mesh. Since this is a rust texture, the surface of the mesh should only be slightly affected. I settled for a value of -.025 to give the mesh a slight indentation where the rust is. In the Texture panel, select the empty texture slot below the color map texture and left-click on the ‘New’ button to add a new texture slot. This technique of using layers and layer masks in GIMP can be expanded further. I have used this method with a dark texture and used the layer mask to reveal the dark texture to add dirt to the mesh’s color map. I then duplicated the color and dark texture layers, merged them down into a single image, added a layer mask to the new image and a rust texture layer below it to add rust. I then duplicated and merged these layers to produce a new image. A layer mask was added to the new image as well as a bright steel texture below that. I edited the layer mask to reveal the bright steel texture to produce scratches. I created bump maps at each step by displaying the layer mask, right clicking on the layer and choosing >> ‘New from Visible’ from the menu. This can obviously become very complex in GIMP, but careful naming of the layers in GIMP can help you keep track of what each layer is for. The aim of this article was to provide a basic workflow for creating bump and specular maps quickly using GIMP. This was a method I used while working in the older Blender 2.49. With all the great work from the developers working on the new Blender 2.5x/2.6x versions, there have been a lot of great things added that I have not mentioned here. Now that Blender has the ability to display bump maps in the 3D viewport, bump maps can be painted in Texture Paint mode and the results can be seen on screen (it’s almost like sculpting in fine details without using the multi-resolution modifier). One can also use custom brushes in Texture Paint mode and there is even an Add-on called ‘Material Utils’ that allows one to quickly switch which texture layer is currently being painted on as well as a few other goodies for texture painting. I regret I did not touch on these topics in this article, but now, thinking of all the texturing goodies in Blender, I’m beginning to think one could write a whole book on the subject! In this tutorial you will learn how to use Blenders loop tools for a complicated set of modeling tasks. Using loop tolls in Blender is a bit trickey and this step by step tutorial will get you through it. Loop tool and choose circle (W). Select random vertices on the sides of the cube (C for circle shaped selector). Use this technique on all the sides. Delete all the selected faces (X). Go to top view (Num 7). Select the top part of the circle. Select the inner shape (Alt + Shift + Right Mouse button). Go to edit mode (Tab). Use this technique to create a square, substituting S Y 0 with S Z 0 or S X 0 where appropriate. Repeat on the circle on the opposite side. Cut the circle holes in the bridge. Select a circle on the cube and one on the bridge. Add some loop cuts. X 10 (Ctrl + R then scroll the mouse wheel). 3. I want it to be able to catch your eye. Of course at the moment it doesn’t quite have enough in it to make you stop and look at it. At the moment this scene looks ok, (pretty reasonable actually), but it is still lacking quite a bit of detail, color, and life. Lets get started fixing up this image. This is what the finished product will look like. As you can see, there aren’t HEAPS of changes, but enough to fix the problems listed above. I’m going to take you through the steps I used to give you the finished product. 2. I want it to look as if someone is currently living in it and has been for a while. At the moment however, there are no signs that anyone is living in it. Now we know why to add this, why not learn how? (If you would prefer to watch this tutorial as a video rather than reading it, you can click here) It is very quick and easy to make this smoke because we will be using the cloud generator Add-on. As the name suggests, this generator is normally used for making clouds but it also works well for making smoke. 1. First, go to the User Preferences window (File --> User Preferences) and then to the Add-ons panel. Using the search box, search for “Cloud” and you should be able to find the cloud generator. Enable this Add-on by checking the box next to it. You can now close the User Preferences window. 1. I want it to be easily recognized as a happy, cartoon style (but still realistic) floating island with a house built on top of it. At the moment however, it looks like it could be a house that has been dug up and thrown into the air. house. It also tells us that the chimney is being used and not just there for decoration. First off, why are we adding this? 2. Next, add a cube and in the toolbar, you should be able to see a panel called “Cloud Generator”. Select your cube and then press “Generate Cloud” 3. Ta-da! You’re finished! It doesn’t get much easier than that! been here for a while (this adds to the ‘feel’ we are going for). They also add some more color and variation to the scene. Take a look at the original scene, it doesn’t look quite right and it looks too perfect without it. The weeds make the house look more realistic and soften the edge around the base of the house. How? It is VERY easy to make these, just add a plane, model it, texture it and Ta-da! Grass! Of course I didn’t tell you EVERY little step that goes into making this grass but Andrew Price from Blenderguru.com has already made a tutorial on how to do this. So make sure you check it out. This is a bit of a different step to the other ones and the reason I’m adding this step is because your scene is going to be very different to my scene so adding Smoke and Weeds isn’t always going to provide the finishing touches you are after. It is always good to ask for feedback and suggestions for your artwork. I usually post my images on Facebook and ask for suggestions there. So that’s what I did with my image as I wasn’t quite sure what else to add at this point. Why? The main reason I added these flowers was to add some more variety and color to the grass which is currently quite plain. How? Add a cylinder and model this into a stem. Then add a sphere to go on top. Scale this sphere down along the Z axis and then add a plane. Model the plane into the shape of a petal, keeping only 4 vertices. If the flower will be close to the camera, add a subsurf modifier. Then duplicate these petals and place them around the edge of the sphere. Why? These were a suggestion I got when I posted my image on Facebook so I thought I’d add them in and see how they looked. They worked quite well and did a good job at adding some color to the scene that was not there before. much of at the moment (except for the roof of course). Without it, there would be too much green near the bottom of the house which doesn’t look too good. How? I just googled “Bike” and found a royalty free picture of a bike and added it into Blender as a Background Image. Then I modeled the bike using mostly cylinders, and finally added red and black materials to finish it off. They also show you that someone lives in this house and is taking care of them How? The stems were made in the same way as the previous flowers, but the flower part is just a sphere scaled up along the Z axis with a little bit of modeling. The pot was a circle extruded up with a little modeling and then another circle near the top for the soil. When involved in any project, there comes a point where you have to decide whether or not you are going to cut corners. Time might be a factor. In fact, time is often a big factor when deciding how much you are going to do yourself. I am talking about modeling. Modeling is often the most time consuming part of any project. At least for me it is. I always end up having to decide if I am going to model everything myself or if I am going to save time and download models created by others. They have an amazing collection of quality 3D objects created in Blender in a wide variety of categories for use and study. Most are even textured, making them ready for use in your scene with no further effort on your part. The number of available models grows daily, so check back often to see what is new. When you have time, doing all the modeling yourself is part of the fun. But just because you want to do it yourself, doesn't mean that you couldn't use just a little help. That's where tutorials can be very helpful. 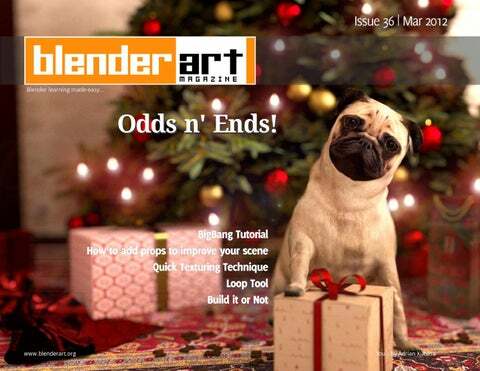 BlenderArt Magazine Issue 36 Odds n' Ends! No matter what Blender projects you have planned for this year, at some point you will need a variety of 'Odds n' Ends' to flesh it out.